Hades and Persephone have a son, and he's feeling trapped in the underworld. Bion's one solace is his friend since childhood, Myrinne, a mortal girl who was adopted by Charon the Ferryman. When Myrinne is kidnapped during a jailbreak from the underworld, Bion's rescue becomes a chance to experience life in the sunlit lands. He promptly falls in with Spartans who are desperate enough to raise the dead to fight a looming Persian army. But meddling in a war the gods have sworn not to interfere with isn't likely to put him in Zeus's good graces — and Bion needs the god's favor to help Myrinne, who's turning out to mean even more to him than he realized. 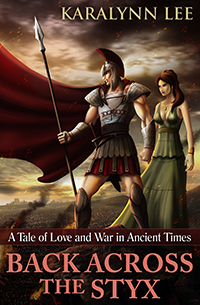 A Tale of Love and War in Ancient Times.